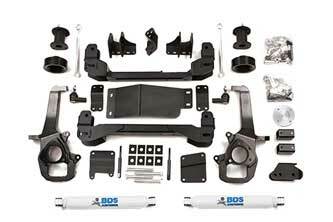 BDS Suspension is now shipping a full line of suspension systems for the 2017 Dodge RAM 1500 4wd trucks. 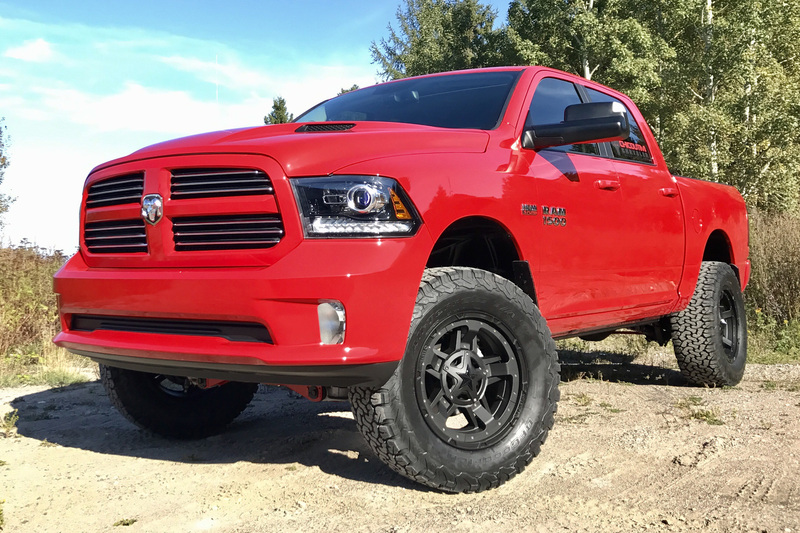 Available in 4", 6" and 6" performance coilover systems for the standard RAM and 4" lift systems for the air-ride equipped RAM 1500, BDS Suspension offers suspension options to meet your needs and fit 35-37" tires. 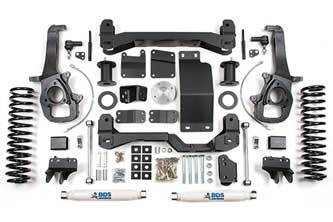 These kits carry over from 2013-2016 models and have been confirmed compatible with the 2017 RAM 1500 trucks. As with all BDS kits these include Factory Protection Plus (FPP) for peace of mind wherever your adventures may go. Included in FPP is BDS's No Fine Print Warranty, FMVSS No.126 ESC System compliance testing, and a 5-year, 100,000-mile supplemental drivetrain warranty. Improve the performance, capability, and curb appeal of your new 2017 Ram 1500 with BDS Suspension. 4" Standard Lift Kits: Designed for the dual purpose ride, this 4" lift kit offers impressive handling for the driver that wants both on-road drivability and off-road performance. 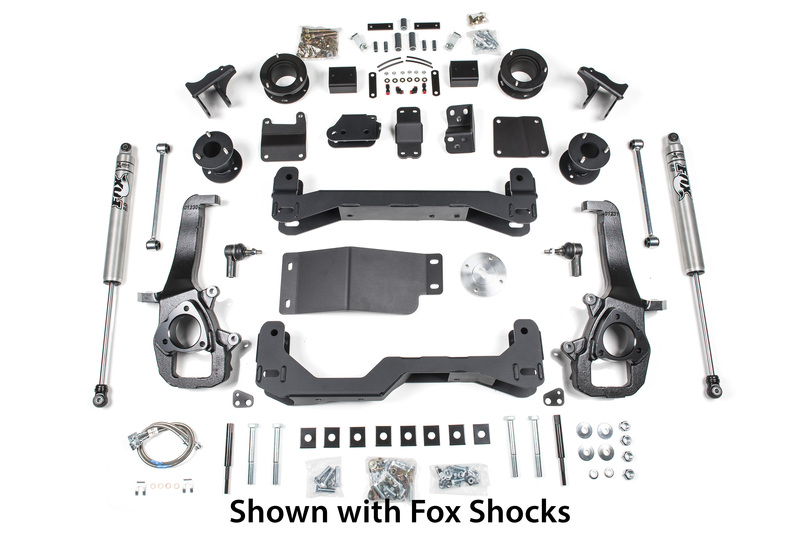 These systems include a pair of high clearance laser cut crossmembers, heavy-duty steering knuckles, new tie-rod ends, 3-point differential drop system, differential skid plate, front sway bar link extensions, and a billet aluminum driveshaft spacer. Top mounted strut spacers are included to retain the factory ride quality. In the rear the kit uses control arm and track bar brackets, sway bar links, 2" coil spacers or 3" coil springs to level the stance and your choice of BDS NX2-series or FOX 2.0 IFP performance gas shocks. This system allows clearance for 35" tires to be installed. 4" Air Ride Lift Kits: These systems are built off the standard RAM 1500 kits and are designed to work specifically with the factory adjustable air ride system to allow full functionality and the ability to raise to 6" and lower to 2" of lift. 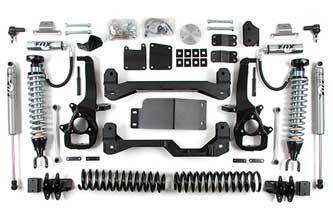 These systems include a pair of high clearance laser cut crossmembers, heavy-duty steering knuckles, new tie-rod ends, 3-point differential drop system, differential skid plate, front sway bar link extensions, extended brake lines and a billet aluminum driveshaft spacer. 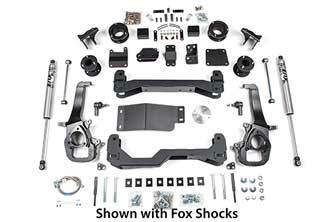 In the rear the kit uses control arm and track bar brackets, sway bar links and your choice of new shocks. The system includes front and rear air bag spacers along with all the necessary air line fittings to allow it to function flawlessly and accommodate up to 35" tires. These kits are designed for the air ride RAM 1500 only; RAM Rebel models may require additional modification to allow proper function of the air-ride system. 6" IFS Lift Kits: Stepping up to the 6" lift kit, BDS offers kits ready to tackle any terrain you can throw at it. These kits are designed to fit up to 3" tires and improve the overall ride quality. 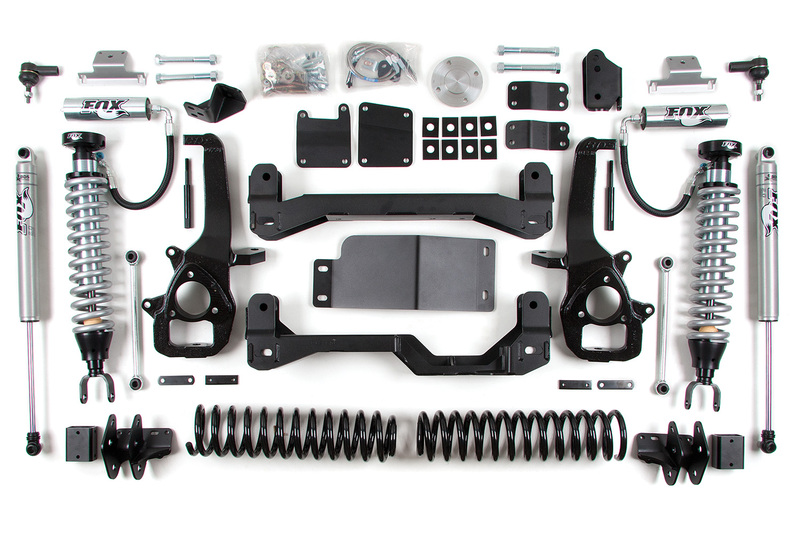 These systems includes a pair of high clearance crossmembers, CNC machined ductile iron steering knuckles, heavy-duty tie rod ends, 3-point differential drop system, and differential skid plate to lock the rugged sub-frame together and offer additional offroad protection. Also included is a billet aluminum driveshaft spacer, front and rear extended sway bar links, stainless steel brake lines, bump stop extensions, rear control arm link relocation, rear track bar bracket, front strut/preload spacers, and your choice of 3" or 5" rear Proride coils for your desired stance with room for up to 37" tires to be installed. Finishing off the rear is your choice of BDS-NX2 or Fox 2.0 performance gas shocks. 6" Performance C/O Lift Kits: Nothing complements a BDS 6" suspension system better than the race proven design of Fox 2.5" remote reservoir coilovers. These have been specifically engineered to fit the 6" BDS system and feature an external reservoir for increased oil cooling capacity and nitrogen volume for a more consistent and comfortable ride. 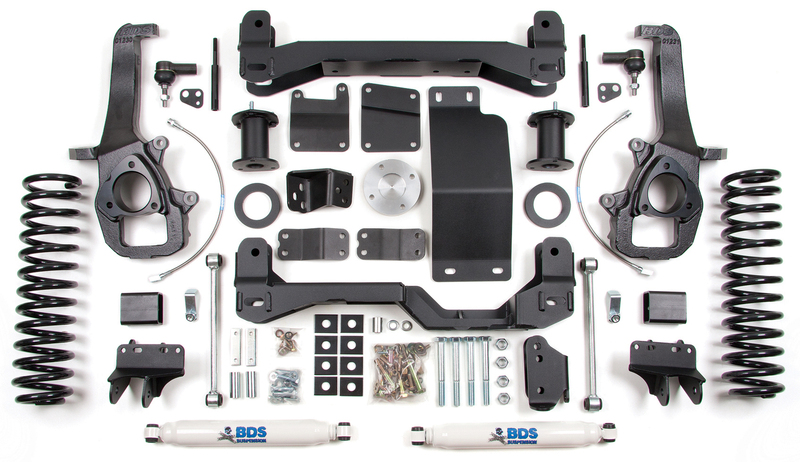 Other upgrades to the standard BDS 6" lift kit include front reservoir mount and rear Fox 2.0 shocks all coming together for a suspension package that is built to perform out in the desert, the trail, and on-road. These kits are designed to fit up to 37" tires. 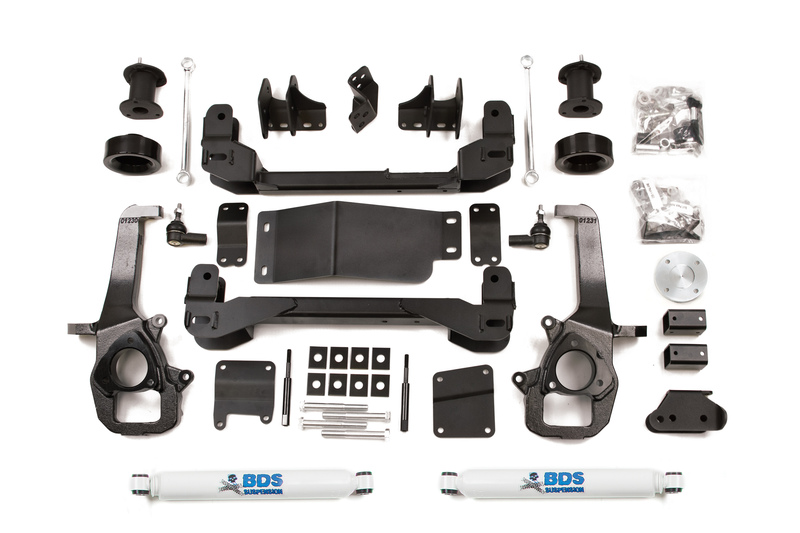 For a full listing of products available for the 2017 RAM 1500 truck, check out the BDS Suspension website or call (517) 279-2135. My brother wants to make sure that the suspension of his car is in perfect shape. It was explained here that there are different kits depending on the size of the lift. Furthermore, it’s recommended to go to trusted auto parts for quality suspension lift kits.